The Science and Uncertainty of Sea Level Rise: 8 inches or 10 feet by 2100? 8 inches or 10 feet by 2100? Pacifica California, just south of San Francisco, is my adopted hometown of 25 years. It has garnered national attention as an icon of dangerous sea level rise as eroding cliffs dangled homes over ocean bluffs (discussed in a post a few years ago). To the delight of property owners and the dismay of environmental extremists, I became a member of Pacifica’s Community Working Group on Sea Level Rise. Governor Jerry Brown’s California Coastal Commission has advised coastal cities to consider that by the year 2100 we should expect a range of sea level rise from 3 to 10 feet due to climate change. Based on such predictions the city will map flood zones, and properties in those zones could suffer from Coastal Commission restrictions that will devalue their property. The Coastal Commission also pushed Pacifica to include ‘managed retreat” as one adaptation strategy that could sacrifice people’s homes. The policy “allows long term shore recession over time, requiring the removal or relocation of structures and infrastructure, realignment of roads, etc.” The Coastal Commission prefers managed retreat versus armoring sea bluffs, arguing our beaches are maintained by locally eroded sediments. However, studies show our beaches are maintained primarily by sediments flowing from the Sierra Nevada that reach our coast via the San Francisco Bay. Extreme environmentalists have argued in favor of managed retreat, wanting nature to take its course, despite negative effects for property owners. They argued it is the most inexpensive option for city tax payers. However, citizens directly impacted do not want their property values to suffer based on shaky sea level predictions. Thus there has been a fierce public debate on sea level rise adaptation strategies for Pacifica, as elsewhere, and was just picked up by E&E News and reprinted in Scientific American under the title Prepare for 10 Feet of Sea Level Rise, California Commission Tells Coastal Cities. I have argued at every meeting that a 3- to 10-foot sea level rise is based only on the most extreme untested speculation. At the very least Pacifica can wait 20 years to test the validity of these extreme sea level rise hypotheses before enacting policy. Scientific American accurately reported, “Some of the climate change exaggerations of 3 feet of sea-level rise is equal to fearmongering,” stated Jim Steele, with the Community Working Group on Sea Level Rise in Pacifica,” then continuing my comments, “sea level has risen about 8 inches over the last century, a rate of about 2 millimeters a year. 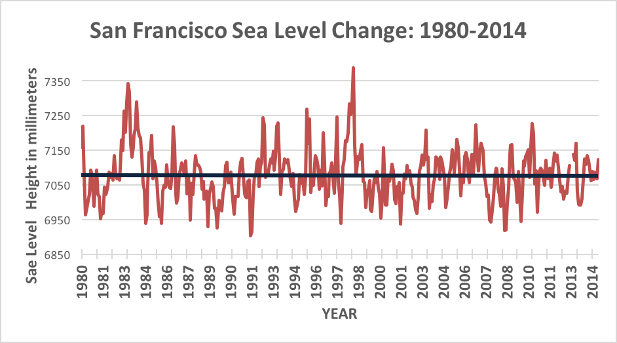 If that rate continued, it would take 144 years to rise just 1 foot.” What reporters failed to mention is I also stated from 1980 to 2014 there has been absolutely no rising sea level trend for San Francisco (as well as the west coast of the Americas) as seen in graph below. However, I suspect changing winds associated with the Pacific Decadal Oscillation, California’s sea level rise will revert back to 2 mm/year and perhaps increase to 3 mm/year over the next 2 decades. Our public discussions had focused only on adaptation policies based on the Coastal Commission’s sea level rise estimates. But because the validity of those estimates had not been discussed, I sponsored a public panel discussion event: The Science and Uncertainty of Sea Level Rise: 8 inches or 10 feet by 2100? David Behar, the Climate Program Director for the San Francisco Public Utilities Commission joined me. In 2013 former Interior Secretary Sally Jewell appointed him co-chair of the federal Advisory Committee on Climate Change and Natural Resource Science, so it was a balanced panel. Behar is responsible for guiding San Francisco’s adaptation policies. His belief was rates of regional sea level rise would return to 2 mm/year but continue to accelerate. How much acceleration to trust however was the critical question. Adaptation policy must rely on official scientific reports, but 5 official reports have all offered different guidance, making formulation of adaptation policies very difficult. Because the more extreme estimates, such as 10 feet by the year 2100 were untested speculation, he advocated adopting middle of the road estimates on sea level rise acceleration. I argued whether you believe recent warming is natural or anthropogenic, warming can enhance monsoons that store more water on the land, and climate models predict warming will increase snow accumulation over Greenland and Antarctica. Such dynamics counteract sea level rise. Furthermore the 20th century experienced periods with greater acceleration of sea level rise than satellites have observed over the recent decade. So, I argued we must disentangle natural oscillation effects from any CO2-driven effects to scientifically guide adaptation policies. Thus, we need about 20 years of more data. In contrast to concerns that rates of sea level rise have increased to ~3.1 mm/yr, 20th century tide gauge analyses revealed rates of rise of 4+ mm/ year every 20 years from 1900 to 2000 as illustrated in the graph below from Holgate 2007. The IPCC reported a similar range of acceleration but it was restricted to the 1930s and 40s using a different set of tide gauges that were averaged over longer time periods. 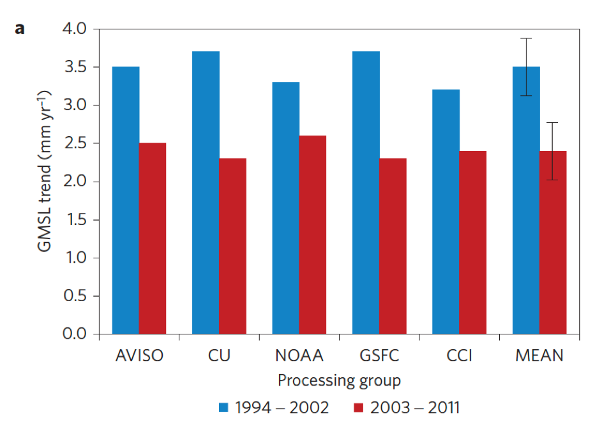 These observed oscillating rates of sea level rise can be attributed to natural variations. The twenty-year periods of sea level acceleration can be explained in part by the Pacific Decadal Oscillation’s (PDO) effect on the winds and El Niño’s. A positive PDO results in more El Nino events during which a greater proportion of rain falls back on the oceans causing global sea levels to rise. In contrast during a negative PDO, more La Nina events enhance the Asian and Australian monsoons so that more rain falls on land, causing sea levels to fall. In 2010-11 sea levels fell by 7 mm, despite extreme melting in Greenland. Two decades of satellite altimetry data also detected oscillating rates of sea level rise, but misleading adjustments have obscured those results. From 1994 – 2002 satellites detected a 3.5 mm/yr acceleration in the rate of sea level rise, and CO2-modelers boasted that was just what their models predicted. However, from 2003–2011 the rate of sea level rise fell to 2.4 mm/yr. The 5 groups that process altimetry data all agreed on the observed deceleration (graph “a” below). However leading sea level researchers published concerns that a deceleration could be “an observation exploited by climate sceptics to refute global warming”, so they adjusted their altimetry data by removing suspected ENSO-PDO effects. Instead of natural oscillating rates of sea level rise with a recent deceleration from 2003-2011, global sea level was then reported as having jumped to an average rise of 3.3 mm/ year as seen in their adjustments in graph “b”. The Pacifica extremists in favor of sacrificing homes and businesses to managed retreat argued those rising rates of sea level would continue as CO2-induced warming continued to rapidly melt Greenland and Antarctica. The result would be sea levels far beyond what any sea walls could protect. 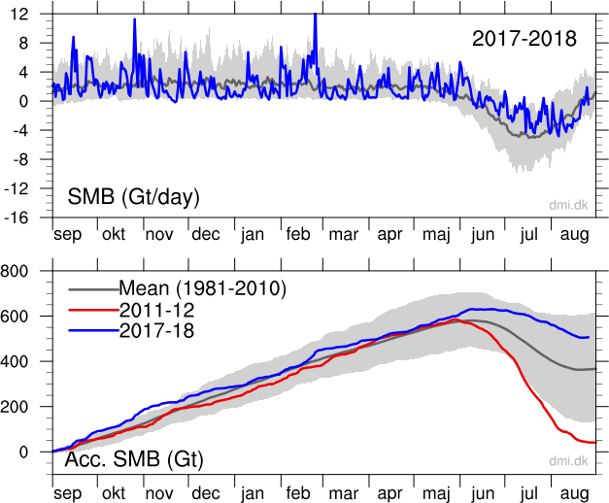 I suggested to a few extremists that in reality Greenland’s ice accumulation oscillates and it had actually gained ice over the last two years (See DMI data discussed by David Burton here). But they scoffed at that fact, saying it simply couldn’t be true. In attempt to heal our divided citizenry, I invited a few of the more fervent extremists to go have a drink, and respectfully discuss the science. They replied, “we do not want to discuss the science,” and not one of them attended our subsequent public panel discussion The Science and Uncertainty of Sea Level Rise: 8 inches or 10 feet by 2100? As I discussed on the panel, scientists reported Greenland had been cooling from 1940 to 2000, and that cooling was hypothesized to be due to increasing cloudiness. 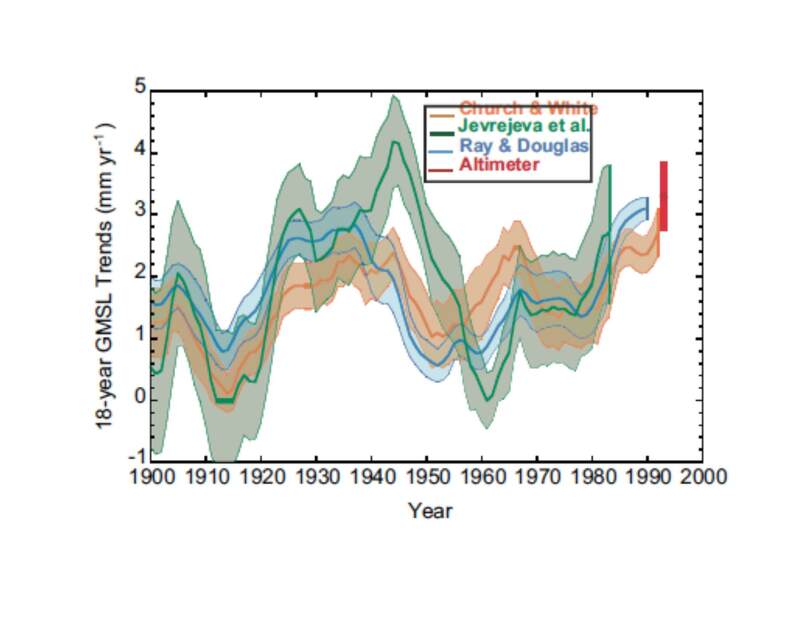 As shown in the graph below from Fettweis (2017) Reconstructions of the 1900–2015 Greenland ice sheet surface mass, ice accumulation was reduced during the well-documented natural warm period in the 1930s. Afterwards ice accumulated reaching Greenland’s greatest rates of the 20th century between the 1970s and 90s. As a rule of thumb if ice accumulation exceeds 400 to 500 Gigatons/year, it counteracts ice loss from glacial calving and basal melting, so Greenland gains ice. Indeed, global climate models predict that on a warming planet, whether natural or anthropogenic, evaporation increases producing more precipitation and more ice over the polar ice sheets. As illustrated between the 1960s and 1990s, Greenland typically gained more than 500 Gt/yr and the IPCC deemed Greenland’s ice mass was stable or slightly increasing with no contribution to rising sea level. However, between the late 1990s and 2012, correlating with less clouds, more solar heating and the negative North Atlantic Oscillation (NAO), Greenland did not accumulate enough surface ice to balance glacial discharge. That triggered global warming alarmists’ worst fears. Nonetheless, if Greenland has truly been responsible for any sea level acceleration from 1990-2012, with an estimated contribution of about 0.8 mm/yr, we should now observe sea level rates to fall by 0.8 mm/yr as Greenland now gains ice. So again, I advised our audience we must disentangle natural oscillations, if we are to let the best science guide sea level rise estimates and our adaptation policies. The suggested steady 3.3 mm/year rise since 1992 conflicted with CO2-driven model predictions of acceleration. So, based on the difficulties of calibrating altimetry with tide gauge data, various researchers claimed satellite drift and biases had over-estimated early estimates of sea level rise from 1994-2002. 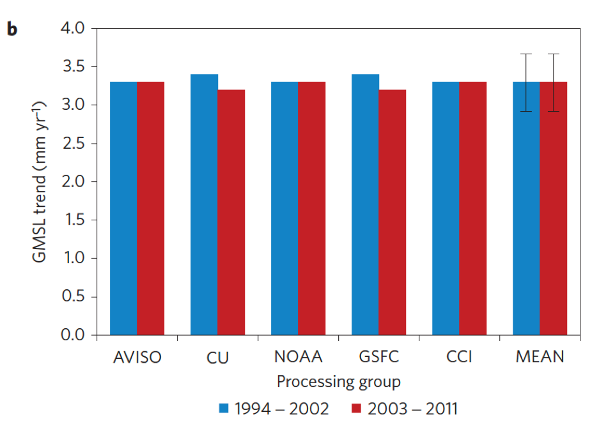 Various adjustments were then evoked, and varying rates of sea level rise published. New global sea level estimates rose at an accelerating rate from 1.8 in 1993 to 3.9 mm/yr today, others at 2.2 mm/yr in 1993 to 3.3 mm/yr in 2014, yet others found satellite adjustments lowered the average rate of sea level rise to 2.6 mm/yr over that same period. Elsewhere Harvard geophysicists were analyzing the effects of mass change on the earth’s rotation and wobble and were disturbed by the misfit between geophysical observations and sea level estimates. They argued that only if 20th century sea level rise was limited to 1.2 mm/yr could there be a good fit with geophysical expectations. The GRACE satellite mission launched in 2002 allowed scientists to measure how much meltwater was being added mass to ocean volumes. However, GRACE data is also fraught with adjustments. 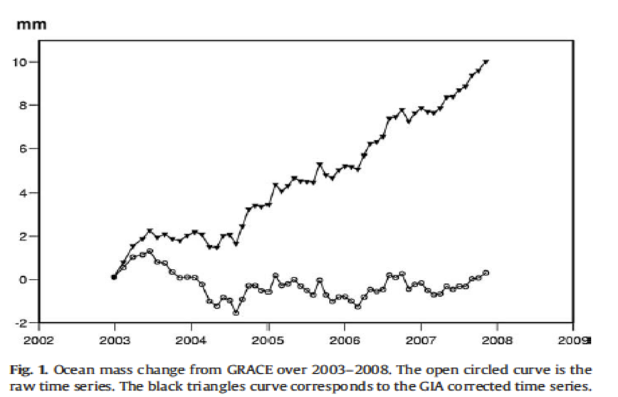 As shown in the graph from Cazenave 2008, quality-controlled gravity data with no adjustments found no added mass to the world’s oceans between 2003 and 2008. That was consistent with NASA scientists who determined Antarctica had been accumulating more ice over eastern Antarctic than was being lost in western Antarctica, and thus Antarctica was lowering sea level, and counteracting any Greenland contributions. However, workers studying Glacial Isostatic Adjustments (GIA) suggested the ocean’s basins are still adjusting to ice age glacier loads and suggested GRACE estimates of sea level rise should add 1 to 2 mm of sea level rise to their observed data. Cazenave chose to add 2 mm/yr, while others subjectively chose to only add 1 mm/yr in other studies. Elsewhere researchers found “GIA models may be unreliable, and that several recent secular Antarctic ice mass loss estimates are systematically biased, mainly too high.” Improving global coverage from GPS systems will allow us to determine which GIA models are more valid. 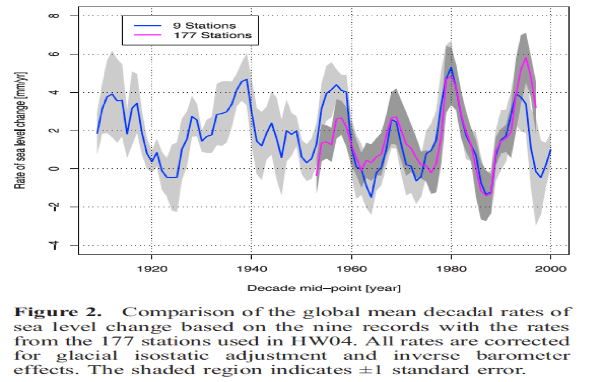 So again, I argued we need a decade or two to test which GIA models can be appropriately applied to sea level change. Finally, the IMBIE team recently reported western Antarctica ice loss has tripled over the past 2 decades, predicting accelerating ice loss to continue. Their conclusions that Antarctica as a whole was also losing ice were based on choice of adjustments, and so they suggested east Antarctica gained only 5 Gt/yr and could not offset ice losses. That contrasted with the NASA team’s estimate that eastern Antarctica was gaining 185 Gt/year. Whose adjustments to trust was discussed here. Nonetheless environmental extremists echoed only IMBIE’s conclusions to justify managed retreat. Again, I argued we must disentangle natural oscillations from any anthropogenic causes. Whatever amount of steady ice accumulates over east Antarctica, the basal melting of west Antarctica’s submerged glaciers will always oscillate. 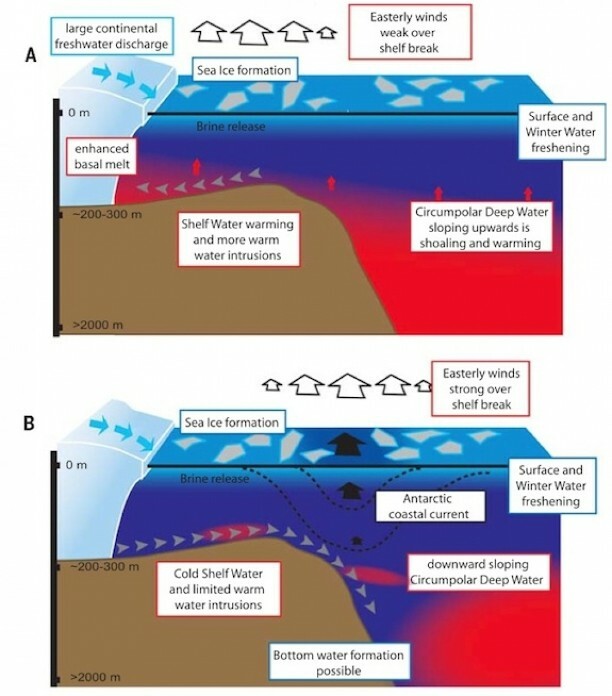 ENSO events affect the easterly winds promoting ~20-year episodes of greater upwelling (A) of relatively warm deep waters that accelerate melt of submerged grounding points of Amundsen Sea glaciers, followed by ~20-year episodes of reduced melting (B). Sadly, I doubt the science I presented will sway extremists or mollify their paranoia that we will be overwhelmed by accelerating sea level rise. Unfortunately, the Coastal Commission argues the “best science available” suggests we consider the extreme 10-foot sea level rise by 2100. So extremists continue to push for managed retreat while home owners whose property values can be destroyed by Coastal Commission fiat will resist. Managed retreat and sea level rise are now front and center of Pacifica’s upcoming local elections. I can only hope we elect councilors who will resist climate extremism. On the bright side, one candidate told me that my comments at public meetings had enticed them to buy my book, so they could take a closer look at climate change. And perhaps, other news outlets other than Scientific American will shine a spotlight on this critical sea level rise issue.